If you're planning a wedding in August or September, dahlias are great flowers to feature in your landscape, as well as for boutonnieres, corsages, the bride's bouquet and flowers to decorate the spaces for the wedding and the reception. Dahlias begin their prime blooming period in August, the month that ranks second only to June in popularity as a wedding month. And they bloom through September until the first frost, so a September wedding is a great choice for dahlia decorating as well. Dahlias combine nicely with other late-summer flowers like late lilies, early chrysanthemums, phlox, asters, zinnias, hardy fuchsias, hydrangea and various everlastings. And they join forces beautifully with more formal, traditional florist flowers like roses and orchids, a nice low-cost way to add more blooms to the more expensive options. 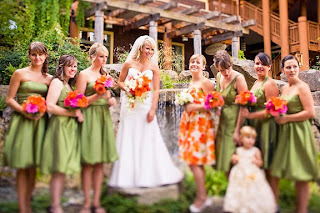 Right now is the time to plan your late-summer ceremony. If it's to be a garden wedding or an outdoor ceremony or reception, there's time now to choose and plant dahlia tubers in your wedding colors. Imagine walking down a path flanked by beautiful dahlias in glowing summer colors, or in cool, serene creams and whites tipped with lavendar or pink. If the venue is away from home, you can plant your dahlia bulbs (tubers, actually) in pots that you can lift from the garden row and nestle in color-coordinated containers strategically placed at your event. 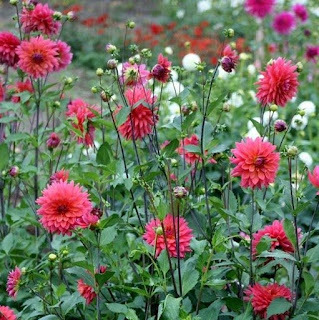 Growers' collections of dahlia tubers (Lynch Creek even has a beautiful wedding collection) make it easy and economical for you to plant a harmonious range of varieties. 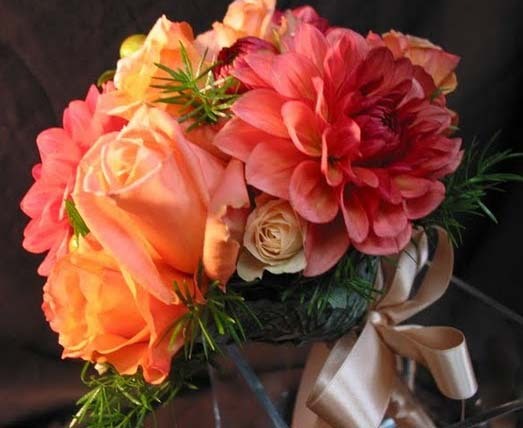 Chances are, no matter where you live, you're not far from a dahlia grower who sells cut flowers, and most will welcome you to visit the gardens in advance of your wedding, choose varieties and place your orders. One way to locate growers in your area is through the American Dahlia Society website; the home page includes a link to a directory of local organizations. 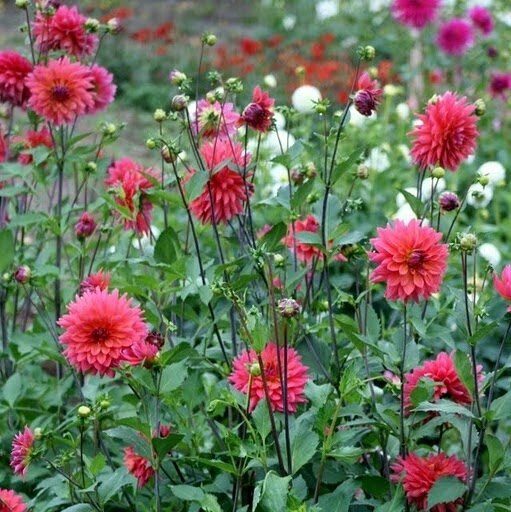 Dahlias' range is wide; as we saw in recent blogs, they flourish in the long days of a sub-Arctic summer in Alaska, and they bloom beautifully in much of the American South as well. It's good for the environment to enjoy foods and flowers in their season. You won't be paying for jet fuel and synthetic fertilizers. And it's good for our esthetic, too. Poets probably would never have rhapsodized over roses as they've done for centuries if there had been airplanes to fly roses in from Colombia no matter what time of year it was. Good things are worth waiting for, and worth reveling in when their time comes. That goes for your late-summer wedding, and for beautiful dahlias.